AVALON — The 2014 Scheyden Catalina Air Show will soar into Avalon and Catalina Island’s Airport-in-the-Sky Oct. 4, bringing a lineup of historic aircraft, daredevil performing aviators and vintage aircraft-related exhibits. Sponsored by Scheyden Precision Eyewear, the market leader for premium lenses and frames engineered for aviation, fishing and golf, the show is the only event of its kind in North America. The Catalina Air Show will feature performances by some of the world’s most skilled aviators such as Dave Mathieson, better known as “Super Dave,” in his customized Scheyden MX2, Jon Melby, Stephan Trischuk, Vicky Benzing and Clay Lacy flying his vintage United Airlines Douglas DC-3. The restored 1950s Albatross One seaplane will once again appear at the air show. 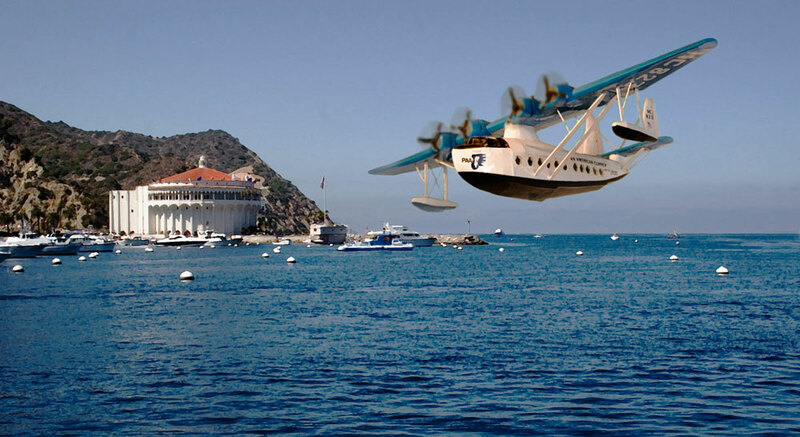 The amphibious plane, owned by Row 44 and based in Camarillo, has a 97-foot wingspan and is 65 feet long — nose to tail. Guests will also enjoy the vintage and specialty aircraft on display at Catalina’s Airport-in-the-Sky. An aerial demonstration will take place off the Avalon breakwater. Street booths with an aeronautical theme will be set up along Crescent Avenue. Although the best places to watch the air show are from the comfort of boats moored and anchored in the bay, there will be several on-land VIP viewing spots. The ticketed VIP Experience will offer attendees a special viewing area with hors d’oeuvres, along with five hours of beer and wine tasting that features Stone Brewery and Firestone Walker Brewing Co. Also included are musical performances by a Jim Morrison impersonator and Dave Brock of Wild Child will join guitarist Robby Krieger of The Doors for a headline performance. “The Scheyden team, Catalina Island’s fantastic residents and all our performers have kicked into full gear and are committed to making this year’s production one that will truly stand out in the world of unique events,” Herold said. The Catalina Air Show is the primary fundraiser for the Catalina Island Aviation Foundation, which helps maintain Catalina Island’s Airport-in-the-Sky, and works with the Catalina Island Conservancy to preserve nesting grounds for the American Bald Eagles that call the island home. For more information or to purchase tax-deductible VIP packages, and other tickets, visit catalinaairshow.com.